A matchmaking system in a multiplayer game is the process of getting players together for online play sessions. In other words, it automatically creates games and puts players into them when they choose to play the game. In Tanki Online, matchmaking refers to the process of distributing players into battles based on their rank and other factors, resulting in a fair match where players or teams have equal strength. The goal of the system is to allow players to quickly join battles and have fair and balanced games. Only in such battles can Black Boxes with Containers fall, instead of regular Gold Boxes. Additionally, Missions can only be completed in these battles. Quick Battles - Recruit - Join a battle with a random game mode. Log into the game, locate the playlist in which you want to play; for example, DM, TDM, CTF etc. Click on the 'Play!' button. Now, wait until the matchmaking system puts you together with a group of players and sends you into battle. Once that happens, a loading bar will appear in front of you, and eventually, you'll be in a battle, ready to play. If you were queued in a team battle mode, a team balance system will first balance the teams to make them more or less equal to each other. This is the list of maps which can be selected for standard battles. The map selection is random, with equal chance for each map. Some maps have two themes - summer and winter. The theme is also randomly selected. Groups of players are treated as a single entity by matchmaking systems. This means that a group can skip from session to session without its players becoming separated from each other. The concept is particularly well-suited to playlists, which can automatically handle the logistics of finding or creating play sessions with enough room for the whole group. Upon reaching the rank of Private, a player unlocks the ability to join and create groups. Groups have rank limits. All of the players in the group must be not more than 5 ranks above or below the group’s creator's rank. So for example, if the rank of the group's creator is Legend, all the players in the group have to be ranked General or higher. Groups can consist of no more than three members. Groups can only play in team battle modes. When queuing, the group will join a battle based on the highest rank of the members in the group. If a member cancels the search for battle in a group, the search is canceled for the whole group. Groups may only join the same team. Group members can change their equipment without the need of leaving it. You can join a group only through an invite by someone who created that group. 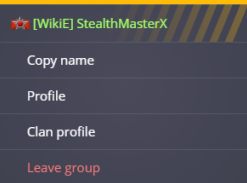 If you're willing to create your own group, click on the Group button, invite your friends and get into the battlefield! Now, invite your friends to your group by clicking on the "Invite to the group" button. Doing so will open up your friend list. Your friend doesn't receive the invite because they're already in a battle. Your friend accepts the invite and joins the group. Your friend declines the invite and doesn't join the group. Once you've invited your friends, click one of the many buttons in the lobby to start a game. You can choose anything from Quick Battle to Control Points and Deathmatch to Assault to play any kind of battle. In Matchmaking (non-PRO) battles, more experience is earnt when completing the objectives of the battle - capturing flags in Capture the Flag, destroying tanks in Team Deathmatch, etc. Experience and battle score are not the same thing. Experience aids progressing up in Rank, battle score is required to complete certain Daily Missions. Below is a table containing the battle points and experience earnt per action in Matchmaking battles - keep in mind that the values below do not change according to how many players are in the battle. In the literal sense, the matchmaking system makes it impossible to send a mult into the enemy team. You will no longer need to worry about someone possibly playing for the other team (a.k.a sabotaging his/her own team) in any battle. In the matchmaking system, every battle will start from exactly eight minutes. Joining a battle in the middle is still possible, but the system favors creating new battles more than making people join battles that are already underway. The teams in Matchmaking battles will be almost always full right from when the battle begins - the system tries to fill up empty slots in battles as fast as possible. On 8th August, 2017, the first official test of the test version of the Matchmaking System took place. Due to the hundreds of bugs and glitches with the update, hefty amount of frame rate drops and a lack of understanding, the update was met heavy criticism - mostly negative and exaggerated. Some of these discrepancies included long waiting times, inability to log in and load components of the game, heavy FPS and PING and latency periods, removal of missions button from its usual place, and perhaps the most infamous of them all, recruits being able to play Legend accounts. All of this drama led to almost a hundred and thirty pages of people openly negating the update in its official topic, becoming one of the most disliked update tests of all time. Thankfully, the test only ran for two days and the game returned to normal on August 10th, 2017. Before all of this, the matchmaking system had already been mentioned a couple of times in the video blogs, but it was not until V-LOG #138 that most of the questions about the very system were answered. If you still aren't familiar with the concept of this system, we suggest you to watch that V-LOG again. This page was last modified on 9 February 2019, at 11:46.